Recently I watched a presentation explaining that zero waste is a misnomer, that it simply is not possible to produce zero waste. And you know what? He was right. He was right because we poop. Sorry, I can’t think of a better way to say it. But that’s what most species do with digested energy. So de facto, no being can truly be waste free. However, I don’t think of zero waste quite so literally, as this gentleman was doing. Zero waste is a goal. It is a mindset. It’s about being conscious of what materials are left behind after you consume the product, like the non-recyclable plastic bag inside a box of cereal. Zero waste extends to all aspects of my life, not just my grocery purchases. As my home life began to transition to zero waste, I realized this could also extend to my work as well. So with the goal of eliminating all unnecessary items going to landfill, I started this project with many obstacles, hardships, trials and errors. The day our compost bin arrived it all began. This has to be a group effort. Though I’ve found this does work more effectively if one person is designated to be in charge, the entire staff has to cooperate. 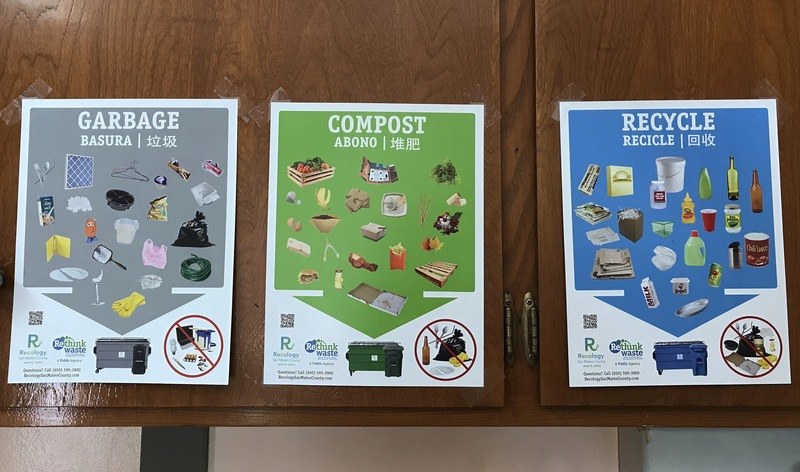 Here in the Bay Area, our recycling and compost is picked up weekly by Recology. Their representatives are very friendly, and with just an e-mail I set up weekly compost pick up, and dropped out weekly refuse pick up from twice a week down to once a week. Additionally, I reduced the size of the main trash bin from 64 gallons to 32 gallons (pictured above), which also reduced our monthly fees – a great selling point to persuade practice owners to make the switch. Step 2: Go over protocol. Step 3: Make it accessible and easy. Not everyone will be 100% on board with this idea. It IS a challenge l to start, but well worth it. 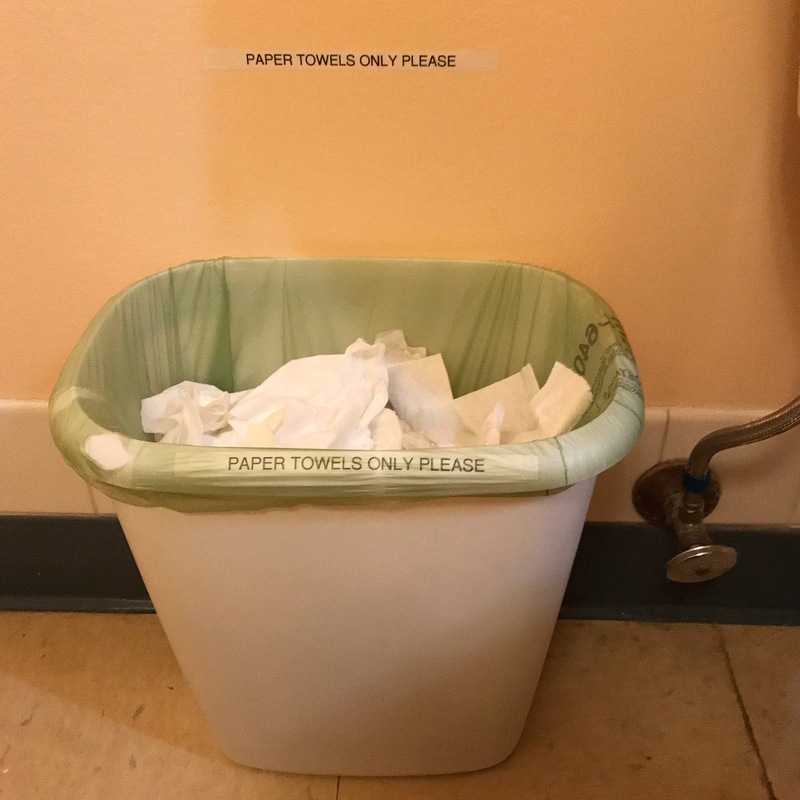 The biggest challenge was getting people out of the habit of crumpling up their paper towel and tossing it in the closest bin. Zero waste was never about convenience but making it as convenient as possible will help motivate those less enthused by the transition. I did this by upcycling old plastic laundry detergent buckets and putting them in cabinets near paper towel dispensers. My theory was if people had to walk into another room to throw paper towels into one compost bin, there was a good chance this would get overlooked frequently, especially during busy hours. Just like when I started zero waste at home, I took Bea Johnson’s advice and looked in my trash to see what exactly was being discarded. I found that it was most paper towels. This was exactly the same at work. Using hand towels to dry your hands is ideal, and possible most of the time. But it’s not always a possibility, especially in treatment rooms with patients. The next biggest contributor was packaging. Medicine, vaccines, pet food, all came in boxes stuffed with plastic insulation. Recology can’t recycle any plastic you can crinkle up in your hand, so I had to find an alternative. Doing some research, and getting several “No’s” before finally landing a “yes,” I discovered a local UPS would take back plastic packaging material to reuse. The first UPS store pretty rudely shut me down, I almost didn’t call the second. Boy, am I glad I did. These two items alone, properly discarded now, reduced our trash by 80%. 80%!!!!!!!!!!!!!!! We would take out 4-5 full trash bags a day before this, now we barely fill one. Since paper towels were our biggest waste item, we wanted to make sure the products we purchase are sustainable. Purchasing paper towels wrapped in paper, and boxed in post-consumer recycled cardboard was ideal. And since paper towels are compostable at Recology, nothing in the process ends up in landfill. 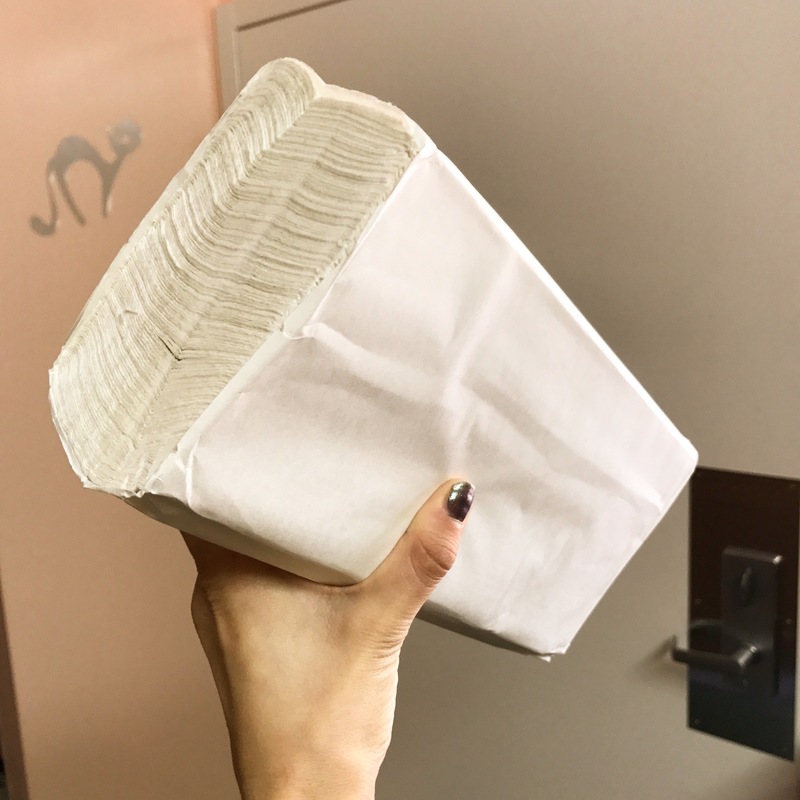 This carries over for toilet paper as well, which can be purchased wrapper in paper from restaurant/hotel supply stores in bulk. When possible, use a hand towel for drying clean hands. Leave them near sinks, if allowable, and ONLY use them to dry clean hands. Step 6: Use technology, not paper. Seriously, go paperless. If you’re not already, slap someone on the wrist. Someone slow so they can’t chase you and hit you back. In 2017, this is not difficult, and will save the company SO MUCH MONEY in ink and paper supplies. Get an electronic signature tablet so authorizations don’t require printing out forms. Allow clients to fill out registration forms online. And if possible, use software that allows receipts and invoices to be emailed. Send reminders via email, not postcards, whenever possible. You’ll save a ton of money on stamps, too! Step 7: Research your materials. 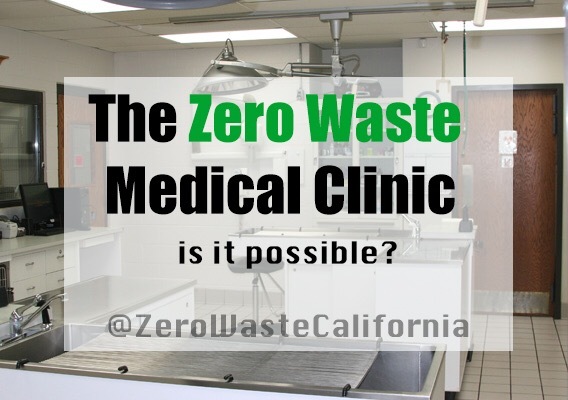 Medical facilities use with a LOT of plastics, papers, and metals, not to mention chemicals and medicines. Take it upon yourself to learn where you can send your refuse. If something is labeled as recyclable, but is not accepted by your local recycling company, find out who can take it back. The wrappers that butterfly needles are packaged in are not accepted at recology. In fact, no plastic that you can crinkle you in your hand can be processed in San Mateo county. (See video clip below) So I researched companies that can. The packaging is quite small, and you can collect them the box they were shipped to in. Once full, drop it off or mail it to the accommodating facility. At the end of this How-To, I’ve listed some places I’ve found that can recycle medical-related materials. Step 8: Stay positive. Focus on success. We can’t really expect our clients to abide by the zero waste policy. Don’t be disheartened when patients or clients leave their refuse behind. 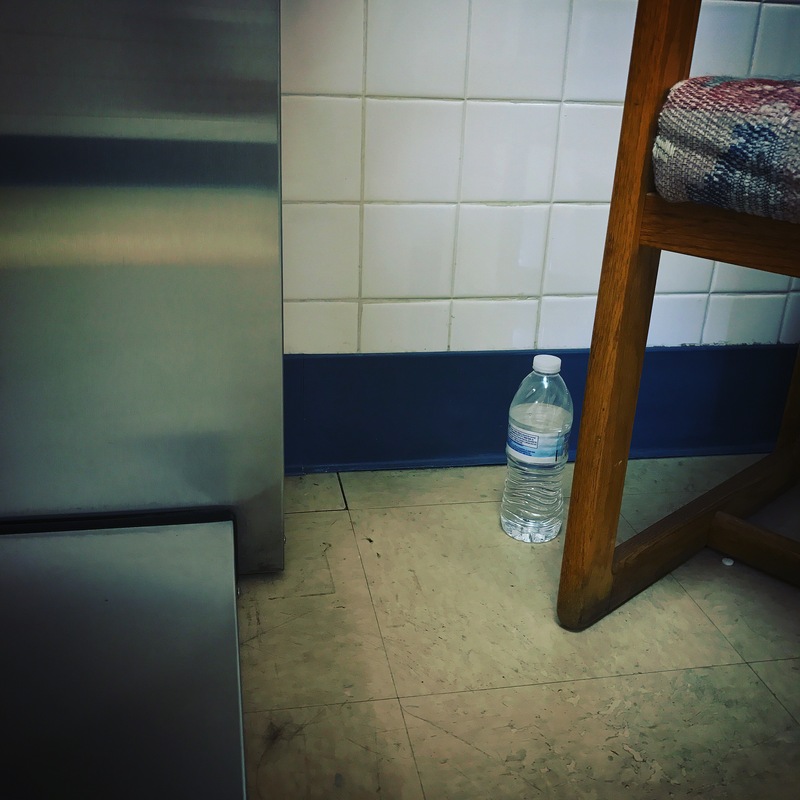 Even a mostly full single use water bottle left in the exam room. Be responsible for sorting through the trash, safely, at the end of the day, to catch any mistakes you or other staff my have made. Again, no shaming. Sometimes the visual of you going through the trash to pull out paper towels is usually enough to remind your coworkers to be more mindful of their actions. Don’t be discouraged when litter is found. Just dispose of it appropriately and move on. Not every item will be recyclable or compostable. The needle as well as the syringe are a serious health hazards to anyone that could potentially handle or be exposed to them. Attempting to recycle them puts the recycling employees at serious risk, especially in human medicine. Some items WILL go to landfill. If its bloody (a syringe, wrap, paper towel) it must be disposed of properly. NEVER JEOPARDIZE THE SAFETY OF THE RECOLOGY STAFF BY EXPOSING THEM TO HAZARDOUS MATERIALS. That is so wrong on so many levels. Sharps made out of any material should be discarded according to state regulations. Hospitals produce trash. Because we are doing our best. If the only carbon and waste contributors came from hospitals, the world would not be in such dire straits. Hospitals contribute a lot of waste, but it’s to save lives. I know some people have the mentality that Earth is better off without people, but I just don’t feel that way. We’re alive and we have a right to receive medical care. The same goes for animals. Medicine is not a convenience. 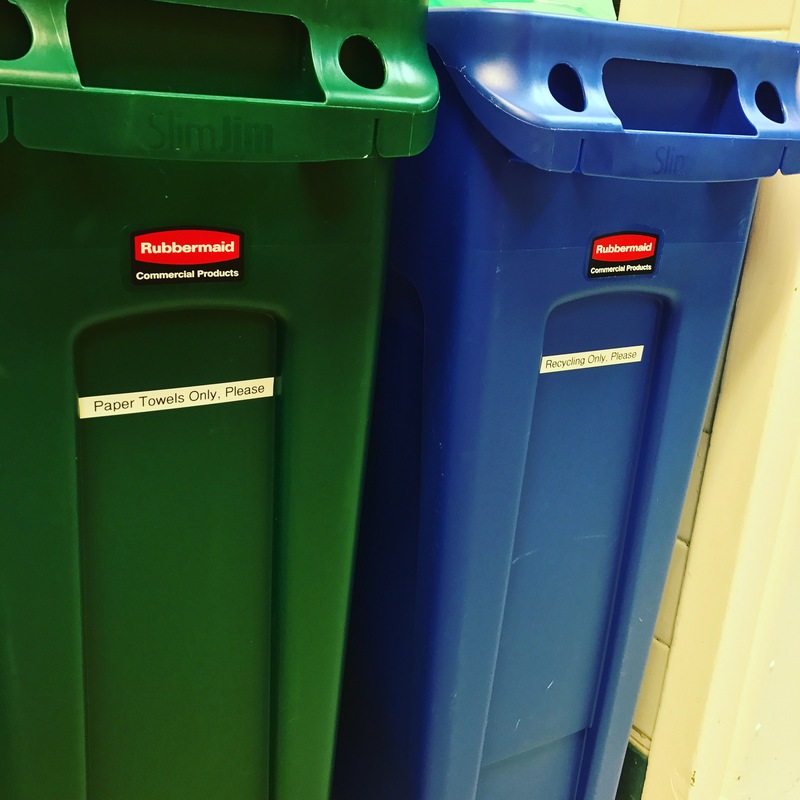 But following these steps will massively reduce a hospital’s landfill trash. 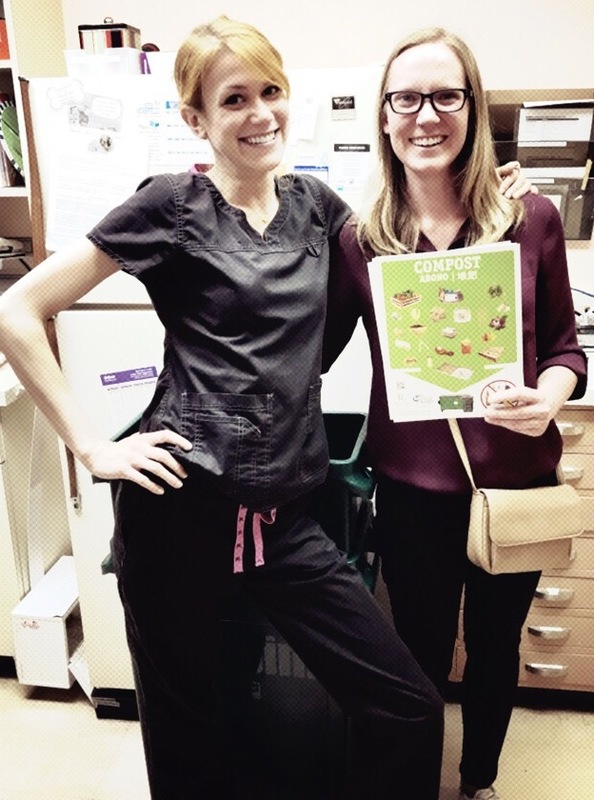 Is it truly possible to be zero waste in a medical facility? No. Just like it’s not LITERALLY possible to be zero waste in general. Everybody poops. We exhale carbon dioxide. But we don’t need to leave materials behind unnecessarily. We must be mindful, conscious, and proactive in all aspects of our life. We’re doing this for Earth, and all the things that live on it. No, zero waste is not literally possible. But it has to be our goal. We have to live sustainably if we want future generations to stand a chance. Our anthropogenic actions pushed climate change and global warming beyond the realm of correction. But we must do everything we can to mitigate the consequences. Together. Use energy star approved appliances. Bring your own sustainable water bottle, always avoid single use cups. Carry a hand towel with you for drying clean hands. We wash our hands a lot, think of how many paper towels you’ll save. Offer to recycle/properly dispose of packaging for your clients. Give them the convenience in return for the comfort of knowing those items were recycled correctly. Cotton balls, swabs: if nonsynthetic, absolutely compostable with Recology. Hair, fur, feathers: 100% compostable by Recology. Tongue depressors: Compostable by Recology. Cat waste\litter: so far no solution I can find. Must be lanfilled. Toxoplasmosis is a serious disease cats carry. Research how it spreads and how it effects humans. Take necessary precautions. Plastic cutlery, plastic straws: Not recyclable. Avoid if possible. Bring your own reusable straw, and provide reusable cutlery in the break room. Microwaveable dinner: that black plastic tray? Not recyclable. And highly toxic. Avoid if possible. So cool! I’m slowly working in my coworkers to get them more eco. I don’t think most of them believe climate change is real, so I’m framing it in a “as Americans we need to not waste these resources and how cool would it be if we kept recycling and re-using these resources instead of needing to re-import them from other countries?” I think it’s starting to sink in, and I’m so glad I found a way to meet them halfway.